Two studies of premenstrual syndrome (PMS), EEG, and photic stimulation have recently been completed at the Royal Postgraduate Medical School, Hammersmith Hospital, London (UK). 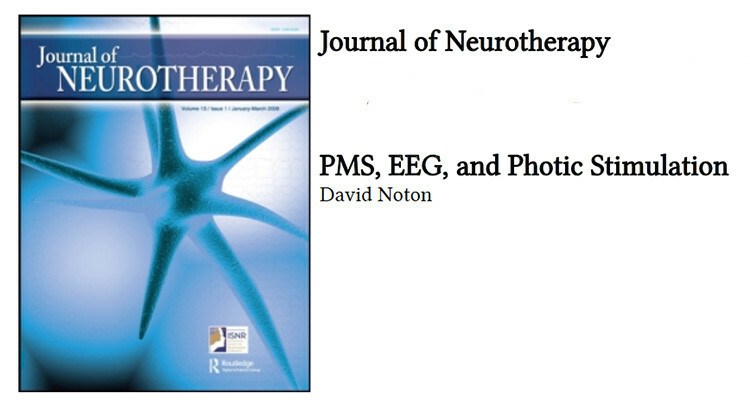 In a preliminary trial of photic stimulation as a treatment for PMS seventeen women with PMS were treated with a take-home flashing light device for 15 to 20 minutes per day throughout their cycle. At the end of three months of treatment the median reduction in PMS symptoms for the 17 patients was 76% and twelve of the 17 patients technically no longer had PMS. Separately, an EEG study of six women with PMS demonstrated that, when they were premenstrual, their EEGs showed more slow (delta) activity and slower P300 evoked response than when they were mid-cycle. These results are discussed in the context of other known “slow brainwave” disorders, such as ADD and Minor Head Injury, and various theoretical explanations are proposed.